Sámiland is the home for Europe’s last remaining indigenous peoples. 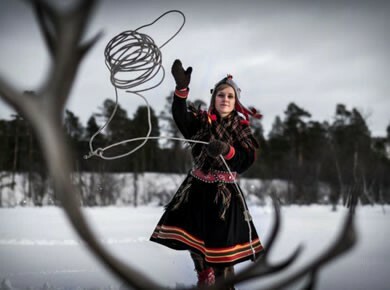 Living culture and modern everyday Sámi lifestyle live alongside the rich history and thousands of tales. These tales, myths, sacred sites, symbols, skills, handicrafts and traditions are still alive today in Sámiland, attracting visitors to explore its fascinating world. It is difficult to draw the line between reality and fiction with Lappish culture, but do we even need to draw a line? Enter the Siida Sámi Museum and Nature Centre or sit around the fire and listen. The tales of the Sámiland surrounding you will come true!